ezine,magazine and e zines,free ezine: March 15,2004 Issue! Three traits are essential for online success. At least, that's what I learned in last 2 yrs and it's not about technology..
1. Sustained Enthusiasm: Easier said than done. But essential. You need to be at the peak and raring to go like the very first day you started your business - each single day. 2. Welcoming Change: They say that 3 months on the Internet is same as one conventional year. Things change so fast that one has to get comfortable with fast changes. And your success-quotient lies in your capability to welcome these changes with an open mind and heart, adapt, improvise and then move on. 3. Solid Customer Service: After 2 yrs, I find that 90% of my customers have become repeat customers. I do not claim that I have given 'Exceptional' service to any of my customers. But I did try to solve my customers problems in the very best possible manner that I can that results in a total 'win-win' outcome for for both of us. Important: This software does a 'trick' on your affiliate URLs so that you get commissions even when your visitors does not hit on your URLs. Caution: This is an undercover technology used by top marketers. Many affiliate tools have the feature of cloaking your affiliate URL and that's the end of it. 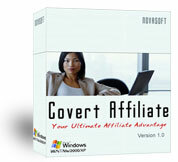 But Covert Affiliate goes a step further. And this is the most important and decisive aspect "Covert Affiliate Software"
It adds a little bit of code to your existing web page and as soon as your visitor views your page - they get tagged with YOUR affiliate cookie. Covert Affiliate both cloaks the URL, hiding your affiliate information, ...and gives the visitor a cookie without his knowledge. Whether your visitor clicks on your affiliate URL or not, as long as he buys the product after visiting your website a few days or months later...YOU get the commission. And that's the way it should be! Your visitor will NEVER EVEN KNOW he's been "cookied" and you are certain to get the commissions. Did you know that posting in Discussion Forums is a wonderful way to make a name for yourself and increase the chances of your success? Well, if you didn't know, you do now! It's true! If you productively spend some time in online business forums each week you may find it quite profitable. When I say "productively" I mean not aimlessly posting to any topic you can find just for the sake of typing. You should actually offer useful advice and information for people as well as answering questions that others have. You will also learn a lot of useful tips to help your business from other people's posts. 1) Exposure to Your Website or Product: In most forums you can put a small information box such as an advertisement below each of your posts. This is a great way to tell people about yourself and your business. You will also gain a link back to your website to help with your ranking in search engines. 2) Making a Name for Yourself: If you consistently offer useful advice and answers to questions people will begin to notice it. Soon enough you be seen as an "expert" in your field. Needless to say, this is very good for your business. 3) Learning: A lot of people frequently post in discussion forums. Many of them have been in online business for a long time and know quite a bit about it. You can gain vast amounts of knowledge by reading other peoples posts. Or you can simply ask a question and you are sure to get it answered many times over. 4) Meeting Other People: Having a home-based internet business can get lonely at times. The people in discussion forums can be a bit like your "co-workers" at a traditional job. You might even make some great life-long friends. 5) Entertainment: Often there are quite interesting topics and replies for you to read. Every now and then someone stirs things up in a forum and it can be pretty exciting to read the responses. Well, that is just a taste of why it is great to post in forums. Of course, there are more reasons and you may even have some personal reasons of your own. 1) It is best to post to forums that get a lot of traff�c. There are many forums out there but quite a few of them hardly get any visitors. You can get a general idea of how much traff�c they get just by looking at how many posts they get each day. If it seems to be getting a lot of posts everyday then it probably gets quite a bit of traff�c all the time. 2) Stay away from forums that aren't moderated or that let you post just about anything you want. These types of forums are generally full of blatant advertising and sp@m. Don't waste your time with them! You won't really get anything useful from these forums. Also, Do Not blatantly advertise or sp@m posts. It will ruin your reputation and could get you banned from forums. 3) Restrict your time in forums by setting up some sort of schedule or time limit for visiting them. You can sometimes los� track of time reading and responding to topics. Obviously you need some time for other business tasks so you don't want to use it all up in forums. Trust me they can get very addicting so this is an important step. 4) Do not post just for your own benefit. It is important to offer useful advice and information to others. By offering valuable comments you will get people to notice you more thus increasing the chances that they will do business with you. 5) Take full advantage of the signature paragraph that most forums let you set-up. This is where you do get to do a little advertising. Tell about yourself and/or your business. Provide a link to your website or product so people can get to it easily. Your link will also help with your search engine popularity and ranking. 6) Be respectful and polite to others on the discussion forums. Even if you don't totally agree with someone it is best not to attack them. People will notice if you are rude and obnoxious. It is better for you to just keep your unnecessary comments to yourself. I regularly visit quite a few discussion forums. I have found that they are fun to read and post in and can be very rewarding. Some are better than others but all can be beneficial when used properly. You just need to find the forums that fit what you are looking for. Become a "regular" there and you will be rewarded. I am sure that is good enough to get you started! The above list consists of many of the most well-known business forums as well some lesser known ones. Pretty much all of them get good traffic and none of them allow sp@m or blatant advertising. Now it is time for you to go and Post Your Way to Success! This is a slightly expensive proposition! But the 9 Power Tools along with the bonuses makes up 10 times more than the money you invest. This is a collection of 9 autoresponder tools and 9 good products as bonuses that will make you an expert in follow-up emails. You also get the resell rights to all these products. This is a simple, inexpensive way to install and run an autoresponder on your site that gives you freedom of operation. Installing this software on your server (easy) altogether stops the monthly charges that you otherwise have to pay with similar services. you also get the Master Resell Rights along with bonuses worth USD 210. 1. Copyright Button(TM) : This is simple method by which you can enable a professional copyright message on your site in seconds. Just place the Copyright Button(TM) in your web page (a simple URL link) and when clicking on it, a new window opens with your Copyright Notice displayed. 2. Update Your Website By Email: What if updating your web site were as easy as sending an email? Simply send an email with your changes and instantly your site is updated. This is ideal for web sites that only need to change a few portions of content on a regular basis. It also reduces your reliance on a web master to make these regular changes. Additionally, for fast breaking news you can even use your wireless device or cell phone to update the content on your site. 3. Add Audio to your site: Did you notice the latest trend in online mkg where the website owner puts his own voice that you can hear. There's a reason for that. Audio increases a site visitors attention span by 50% more. Here's a well written eBook that teaches you the tricks of adding Audio to your website. It also comes with zero-cost flash buttons. Well. That sums up the first fortnight of March-2004. Do not Forget To Rate 'HomeBiz-Tips'. Your valuable vote helps us to improve this E-Mag as well as allow us to keep it Ad-Free.